Using Facebook ads strategically can be a great way to increase Facebook traffic to your blog to earn more affiliate revenue, grow your email list, and more. Helping online business owners harness the power of Facebook ads for these purposes is why I love what I do! Today’s success story is from my friend and former client, Kayla Sloan. And she recently joined my team as a virtual assistant! Kayla is a blogger with her own website, and she’s also virtual assistant for online businesses. She recently created $10K VA, her flagship program where she teaches others the methods she’s used to make a consistent $10,000 per month as a virtual assistant! Starting in the spring of 2017, Kayla and I worked together on her Facebook ads strategy to grow her blog’s following prior to the release of her course. 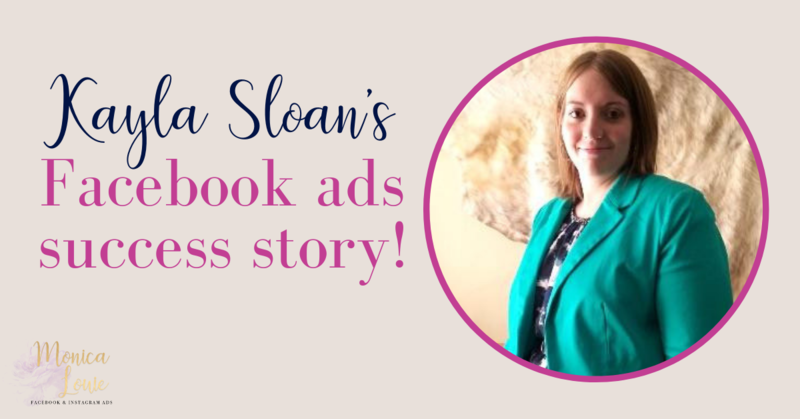 With her Facebook ads, Kayla has learned how to get traffic from Facebook for as little as $0.01 per click! Let’s dive in and see how she achieved these phenomenal results! Thus, she started her blog to get her finances in order and express her creativity. After she started freelancing as a writer and virtual assistant, a few months later, Kayla had a mindset shift and finally started treating her blog and freelance income like a business. She decided to go “all in” on her business and quit her full-time job — despite being $148,000 in debt with her mortgage, student loans, and more. Since then, she’s grown her freelancing business to earn over $10,000 per month! But, Kayla’s ultimate goal was to grow her brand to help people break from the ordinary and start successful businesses of their own. To do that, she needed to get more blog traffic and increase Facebook traffic to get more readers. This is when she turned to Facebook ads. Kayla already heard about the success other bloggers and business owners were having with Facebook ads, but she was hesitant to get started. “I thought my audience was too small, and I wasn’t sure it would be worth it to pay for Monica’s coaching since I don’t have a lot of Facebook fans,” she said. But after hearing about the success many of Monica’s other clients have gotten, Kayla decided to take the plunge! She started with a small number of Facebook campaigns and a tight budget. She kept her ad spend around $20-25 per day as we started testing her ads. The results of Kayla’s first few campaigns weren’t amazing. In fact, her first campaign ended up with an overall average of $0.49 per click. While results can vary depending on the how niche the content and potential audiences are, my clients and I usually shoot to get traffic below $0.10 per click. But, Kayla and I weren’t going to give up! Instead, we went back to the drawing board to put more thought into other topics her audience would be interested in. Doing this really helped! Her next three campaigns had much better results, with average costs between $0.06 per click and $0.17 per click. But, her 5th campaign was when she finally struck Facebook ads gold! For this 5th campaign, Kayla selected a post she thought would resonate well with her existing audience and help her expand her audience with a lookalike audience. 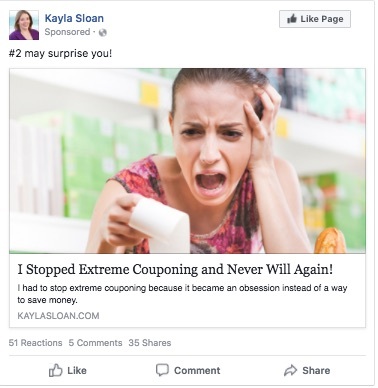 The topic of her blog post was somewhat controversial — why couponing is a waste of time and money. To grab attention in the News Feed, she chose an image that was a bit over-the-top for the ad. The text of the ad used powerful language and word choice, which also helped to grab people’s attention. This is why it’s so important to have all the pieces of your Facebook ad puzzle working together! Our time and efforts paid off since Kayla figured out how to increase Facebook traffic for $0.01 per click on one of her ad sets for over three weeks. After this time, the cost increased to $0.02 per click and hovered there for the next few months! Since then, Kayla’s subsequent campaigns have also been very successful with most of them averaging $0.05 per click or less. In addition to driving cheap traffic to her blog, Kayla’s campaigns have helped to grow her affiliate revenue, her Facebook fans, and her email list — even when those things weren’t her primary goal. This just goes to show you that the power of Facebook ads can go beyond what you’re initially hoping to achieve. Kayla’s biggest takeaway from learning how to run Facebook ads is that it’s essential to have all the pieces of the puzzle figured out so they can fit together. It takes more than just a killer ad to see the results you want to achieve with your business. Your blog post or landing page must also be optimized to make sure the readers you’re attracting with Facebook ads are taking the action you desire the most. Even though the first few campaigns had less than stellar results, Kayla is glad she stuck with it to figure out what works for her audience! 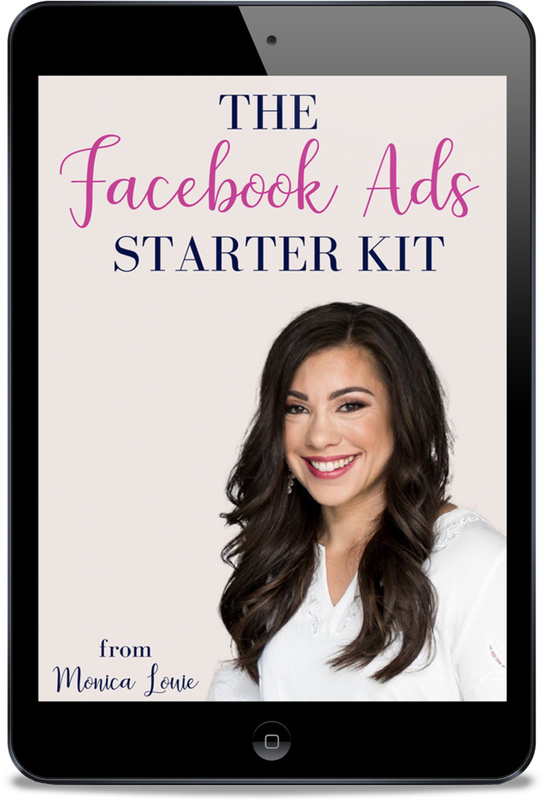 She said that learning how to run Facebook ads the right way from the start, with a strong strategy, helped her avoid wasting money on marketing strategies that didn’t work. Ready to learn how you can get super cheap Facebook traffic for your blog or business? I love your instructions, but if you can explain more like what are the targeted countries for cheap click ? I think it depends on where your audience is. Most of my clients have US-based audiences, so we find that costs are cheaper when targeting the US. If your audience is worldwide, then I would look at your analytics to find out where the majority reside, and then start there. Hope that helps!